WELCOME BACK to the Senate race, Mr. Romney. Where've you been these last four weeks? 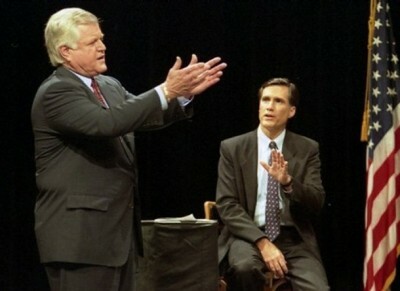 For months, the only issue that mattered in the Kennedy-Romney campaign was Ted Kennedy himself. After 32 years in office, the handsome young executive kept saying, Kennedy was out of date and out of touch and it was time to give the job to somebody else. Voters agreed. Romney soared in the polls. Then came Kennedy's ferocious assault. One commercial after another painted Mitt Romney as a robber baron, a cruel Simon Legree who made millions for himself while (gasp!) denying health care to part-time workers. Suddenly Romney's strongest suit -- his business record -- had become his greatest liability. His poll numbers started dropping. Romney had one hour last night to repel Kennedy's assault. In the most exquisite moment of the debate, he did. "That attack on part-time workers not having health insurance is the height of hypocrisy," he said, every word articulate with fury. "Sen. Kennedy and his family have a multiple real-estate empire across this country, including the Chicago Merchandise Mart, the jewel of their empire. That Merchandise Mart has a free-cash flow, reportedly, of $20 million a year. "Senator, I'm sure you know that your workers who are part-time employees don't have health insurance there, don't you?" Pow! The audience exploded, and so did something inside Kennedy. The expression on his face said it all: The spear he'd been using to skewer Romney had just snapped, and he had nothing left to attack him with. Oh, Kennedy kept throwing punches. He snorted when Romney couldn't come up with exact dollar amounts for a health-insurance bill the challenger said he favored. He chastised him for opening the "Lincoln-Douglas" half of the debate with a complaint about Kennedy's ads instead of "asking me what I was going to do for working families." He tried to hang his own Senate colleagues -- Republicans Jesse Helms, Orrin Hatch, Al D'Amato -- around Romney's neck. But nothing was drawing blood the way Romney's revelation about the Merchandise Mart had. So what was Kennedy to do? He waved the bloody flag, delivered what he hoped would be an unanswerable retort. "Kennedys are not in public office to make money," he thundered. "We have paid too high a cost." It was the most shameless moment of the debate. Ted Kennedy has been debating US senators for 32 years. Last night, Mitt Romney debated one for the first time in his life. As the hour drew to a close last night, it was hard not to wonder: If Romney's this good as a novice, what would he be like with some practice? Why is this state different from all other states?